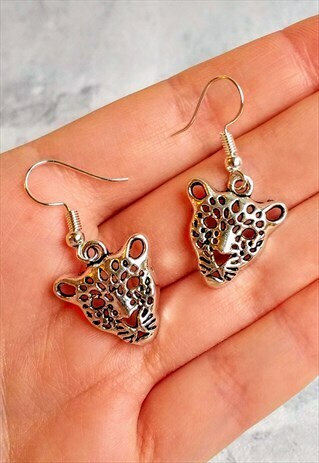 Release your inner wild side with our super cute leopard head earrings! Handmade in Surrey UK, this stunning pair will elegantly compliment multi-pierced ears or could look just as cute as a stand alone piece! Handmade from antique-style silver-tone alloy and worn with a hook back. Pendant is hollow, printed on one side only and measures approx 2cm long. Brand new and gift wrapped in an organza pouch (pouch colours vary). Non-returnable unless faulty due to hygiene reasons. Also available in gold-tone and on hoops! Avoid contact with water and perfumes. Not suitable for swimming or bathing.